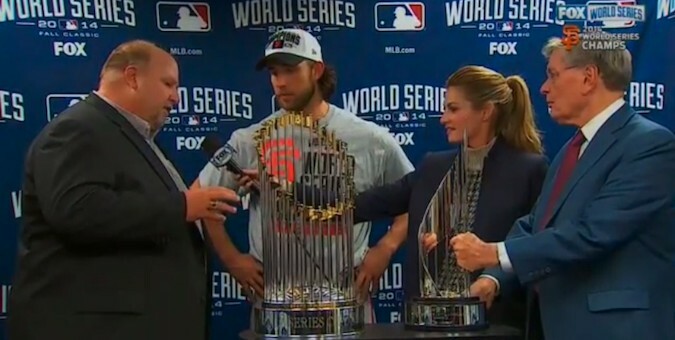 General Motors awarded this year’s World Series MVP, San Francisco Giants’ pitcher Madison Bumgarner, with one of its all-new 2015 Chevrolet Colorado mid-size pickups. Chevy hoped the post-game chatter on Twitter and other social media outlets would be about its new truck, but the man in charge with giving the keys over to Bumgartner, Rikk Wilde, accidentally stole the show. Wilde, who isn’t used to public speaking in his position at GM, was tasked with giving a short presentation speech about the Colorado to Fox’s television audience before giving Bumgartner the vehicle. That sounds easy enough, but Wilde managed to botch his opening statements pretty badly. There’s a good chance you’ve been given a task at work you’re not normally used to doing and made an embarrassing mess of it. The only difference between you and Wilde is he had the United States’ massive World Series Audience watching his every move. You’d probably be pretty nervous, too. For some reason, the media really ran with Wilde’s minor screw up. One particularly rude Washington Post writer noted he looked like “a sweaty car company representative who sounds like he is battling cardiac arrest.” Classy. Albano noted everything Wilde said about the Colorado was true, confirming there is indeed “a lot of stuff in the Chevrolet Colorado.” In our opinion, his embarrassing 15-minutes of fame could have been much worse. Check it out in the video below (if you can survive the awkwardness) and let us know what you think in the comments. Public speaking isn’t any fun and I’ve been there, just not in front of 10 million viewers. Glad he stuck with it and came through. This guys Chris Farley act has done more to get the Colorado out in the media than anything GM did. He screwed up big time but the end results have been better than GM has done in marketing. Just look at all the web postings and all of the news shows this has been on. So many did not watch the game but nearly everyone at work was talking about this. Note many did not know there was a new Colorado until this happened. The truck will last a lot longer than the memories of the poor guys speech!